This brown/grey Blueface Leicester mix is blended with white Tussah silk. 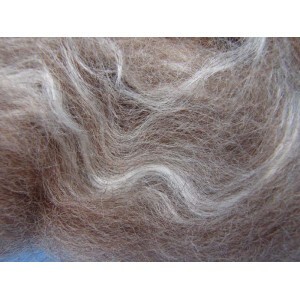 Suitable for spinning, carding or felting, this blend is especially suited for wet felting. During the process the woolen fibres shrink but the silk fibres stay as they are, giving the white strands a wavy effect in the finished piece.